Preheat oven to 350 F (177 C). In a large mixing bowl, add water, vegetable oil, sour cream and eggs and beat lightly on low speed until combined. Add the flour mixture gradually and beat on Medium speed until smooth, approximately 3 minutes. Coat a bundt pan with non-stick cooking spray. Pour the batter into bundt pan and spread evenly around the pan. To remove air bubbles in the batter, lift the pan about 1-inch off the counter and let it fall back on the counter. Repeat this a few times. Bake for 40-45 minutes or until a toothpick inserted into the cake comes out clean. Before serving, dust cake with powdered sugar. Hi. My family loves this cake version. It is now my go to birthday cake recipe. 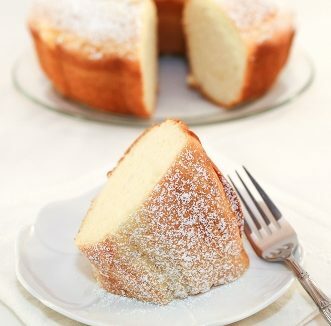 Just wondering, which store-bought white cake mix do you used? Iused Betty Crocker brand. I am glad you like this shortcut recipe. I like Pillsbury Moist Supreme White or Duncan Hines Classic White. Hope that helps! I’ll give that a try next time. Thank you so much for sharing with all of us your recipes! Looking forward to try many more.